Myocardial infarction is more commonly known as a heart attack and it is a significant health concern today. Many aspects of modern life, from unhealthy eating habits to stress-inducing lifestyles, mean that more and more people are developing heart disease and experiencing heart attacks. Heart pain is the hallmark symptom of a heart attack that most individuals often neglect to take seriously enough. Another prominent sign is the intense pressure felt on the chest that people who are experiencing cardiac arrest often describe as an elephant sitting atop their chest. In addition to the pain and pressure, most individuals also experience the same type of pressure in other areas of their upper body such as their shoulders, neck, back, or jaw. Some patients can experience nausea or vomiting, and difficulty breathing, feeling lightheaded, and cold sweats are also some of the most common symptoms that people report while undergoing myocardial infarction. If you find that you are experiencing any of these symptoms, it is crucial to seek medical attention as soon as possible. A heart attack transpires when the blood flow to the heart gets restricted, leading to the obstruction of the arteries. As a result, the heart muscle becomes severely damaged. Time is of the essence when it comes to treating myocardial infarction. When you have arrived at the emergency room, a medical team will determine the optimal treatment option for your particular situation as not every patient gets the same treatment method for their heart event. The process typically involves blood tests and an EKG. Patients stay in the hospital for close observation and monitoring of their heart. While you are at the hospital, you should be vocal about your symptoms such as when there is a change in the severity of heart pain. There are medications used to restore the blood flow to the heart such as nitroglycerin, which is one of the most common therapies used in cases of myocardial infarction. Most medications used in the case of a heart attack also relieve heart pain. Depending on your healthcare team’s discretion, you may additionally be prescribed clot busters, anticoagulants, or beta blockers to both alleviate symptoms and also prevent future cardiovascular events. 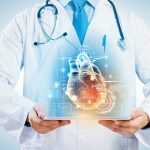 In some cases, medications alone are not enough as treatment, so you may need an angioplasty, which is a procedure that is performed to restore sufficient blood flow. The process involves the insertion of a catheter in a blood vessel around the groin area near the groin area where a balloon-like apparatus is placed inside the artery to clear up the clog. A coronary artery bypass is another surgical option that may be required which restore healthy blood flow to a clogged coronary artery. Recovery time varies person to person following a major operation. You may also need a pacemaker before you can be discharged from the hospital for further prevention. Myocardial infarction prevention is possible. If you know that you have a family history of heart disease and myocardial infarction, you are a higher risk of both, which means you need to be extra cautious. You can keep heart disease and heart attack at bay by maintaining a healthy diet, cholesterol levels, and weight, as well as making regular physical activity a part of your everyday life. Unfortunately, people with seemingly healthy lifestyles can also experience a heart attack, so it is of utmost importance to know your family history and have regular physical examinations as a precaution.